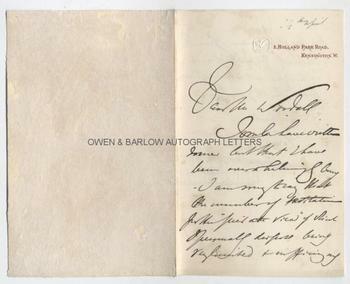 FREDERIC LEIGHTON autograph letter Signed. Lord Leighton. British (English) painter. ALS. 4pp. 2 Holland Park Road, Kensington. October 17th 1875. To "My Dear Sir" [but to William Woodall M.P.]. Together with a contemporary portrait photograph. 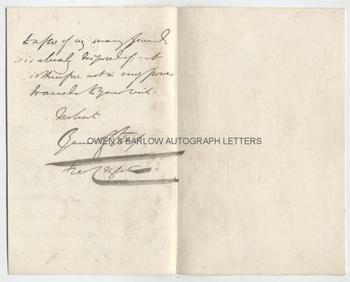 "On returning to England after some absence on the continent, I find a letter which you did me the honour to address to me on the 1st of this month and in which you express a flattering wish that I should this year preside at the distribution of prizes in your Institute. You are not wrong, Sir, in assuming that I take a genuine interest in the objects of that Institute, and may rest assured that the name which is inscribed upon it commends it in a special manner to my sympathy; it is indeed with much regret that I find myself wholly unable to help [?] you in this matter, and for two reasons; the first is that my time is at present more than fully engrossed by the numerous demands on it, some arising out of my profession and others external to it, but all imperative; and the second is that having been on various occasions forced reluctantly to decline proposals analogous to yours, I could not without giving cause of complaint to others, depart at this time from the rule I have hitherto observed. Pray, Sir, convey to the Committee the expression of my unfeigned regret, [etc]." 8vo. Approx 7 x 4.5 inches. Very slight mounting traces to right edge of last leaf, else fine. 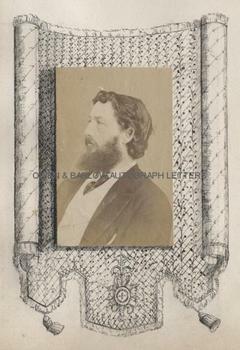 The portrait of Frederic Leighton is an albumen photograph of carte de visite size (approx 3.75 x 2.5 inches, excluding mount) showing the artist head and shoulders in profile. It is mounted on an album leaf with a border of original, contemporary pen-work decoration. 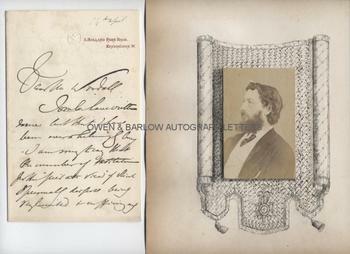 There are some mounting marks to the verso of the card but the photograph is in fine condition. Frederic Leighton, known as Sir Frederic Leighton for 1886 to 1896 and as Lord Leighton from January 1896, was one of the leading painters of his generation. He was President of the Royal Academy from 1878 to his death, when he was succeeded by Millais. Frederic Leighton was associated with the Pre-Raphaelites from the 1860s onwards and is noted for his large canvases of scenes inspired by antiquity and the classics. His most famous paintings include the sumptuous 'Flaming June' and 'The Bath of Psyche'. Frederic Leighton is also noted for the frescoes 'The Arts of Industry' in the Victoria and Albert Museum. William Woodall, M.P. for Hanley and Stoke on Trent was also a trustee of the Wedgewood Institute in Burslem and, in this capacity, he often lobbied celebrated ARTISTS, writers and others to lecture to students at the Institute.